When you are the owner of a commercial space, pavement maintenance is a crucial part of keeping up the appearance and safety of your property. If your driveway or parking lot is chipped, cracked, or otherwise damaged, your customers and employees will not be able to park or drive safely. Fortunately, a pavement repair company can help you make sure that your asphalt remains in great condition throughout the years. Here is a look at some signs that your pavement is ready for a repair service. Once cracks become visible on the surface of your pavement, this is a clear indication that you are in need of immediate repair services. Cracks can form due to normal wear and tear, or as a result of extreme weather and temperature fluctuations. During your asphalt repair appointment, your technicians will evaluate the severity of your cracks to determine the appropriate repair method. Potholes are much more than an unsightly nuisance on the surface of your concrete structure. When potholes begin to form on your pavement, they can cause serious damage to cars and commercial vehicles. In order to repair potholes, your asphalt company will need to fill in the holes and strengthen the surrounding paved areas. Water can seriously damage a paved surface. In the event that you start to notice pools of water standing on your pavement, you will want to bring in a team of asphalt experts immediately. After you have eliminated the pools of water, it may be necessary to strengthen your pavement using the appropriate repair techniques. 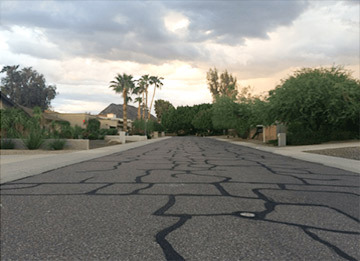 For answers to your questions about pavement repair, get in touch with Cactus Asphalt. We are proud to provide top-rated asphalt services in Phoenix and state-wide, and our team can restore your old and cracked pavement to its original, beautiful condition. Give us a call at (623) 207-8246 to set up your next pavement maintenance appointment. My biggest fear with potholes is snowplows. If a snowplow blade comes along and catches an edge around the hole, it gets so much worse. I am glad to learn that the repair process includes strengthening the surrounding area. This would help prevent the extra damage that could come from plows. It’s good to know that pools of water on your parking lot pavement could be indicative of a need for repair. It’s important that these kinds of issues are dealt with quickly, especially if they are in a parking lot. That way, it won’t inconvenience your guests who use the lot or be a liability to your in the event that it does cause damage to vehicles. That’s good to know that cracks form from normal wear and tear. I guess that means you could plan out your repairs in advance. You wouldn’t want cracks to form potholes, which you said can cause massive damage to your car. Thanks for mentioning that cracks in one’s pavement could be a sign that it needs to be paved once again. I didn’t know that if your cracks are looked at by technicians, they will be able to tell you the best way to repair or replace it. If a business needed to pave their parking lot because of cracks or potholes, I would suggest that they keep your tips in mind. We get serious snowfall in the winter where I live and the ice can do a number on my driveway and paving. I have noticed new cracks appearing this year. Getting a contractor to fix and seal these would probably be the best way to prevent this in the future. I like that you mentioned watching for area of standing water as well. I like how you mentioned that potholes are more than just a nuance and should be repaired. I like to play basketball and have a backyard asphalt court. I recently noticed a pothole and wasn’t sure if I should replace it. I’ll keep an eye out for the pothole to make sure I can continue playing basketball for a long time. I really like how you said that you should get your driveway paved if it starts to crack because of the weather. It’s also nice that you said that you should get it fixed if there are potholes because that can damage your vehicles. My husband and I are looking into asphalt contractors to repave our driveway; thanks for your post.